This easy cake is made with eggnog, a cake mix, and optional rum. This is a delicious cake, and it's quick and easy to make for the holidays. The rum, eggnog, and some nutmeg transform the cake mix and give it classic holiday eggnog flavor. 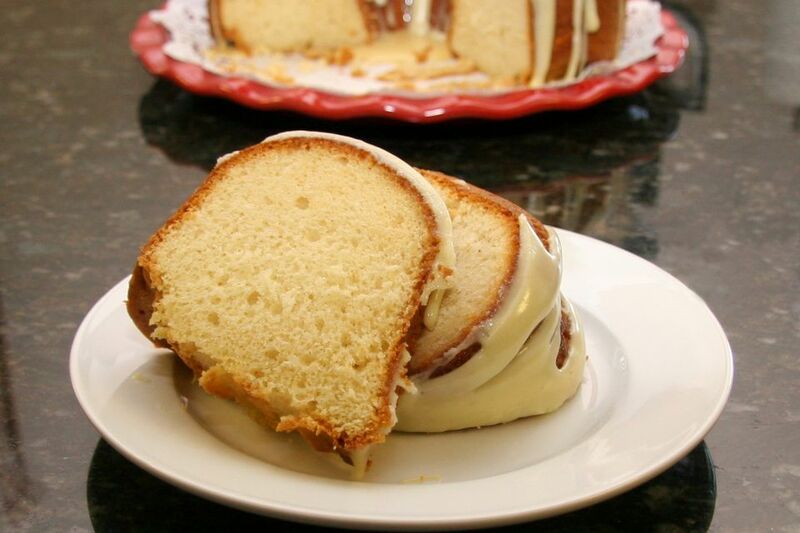 Finish the cake with the flavorful butter rum glaze or dust it with powdered sugar. Generously grease and flour a 12-cup Bundt cake pan. Heat the oven to 325 F.
Beat the 8 tablespoons of butter until light; beat in eggs and eggnog and 1/4 cup of rum or rum flavoring. Add vanilla, nutmeg, and cake mix; beat slowly to combine, then beat on high speed for 2 minutes. Spoon into the prepared Bundt cake pan. Bake the cake for 35 to 45 minutes, or until a cake tester or a long wooden pick comes out clean when inserted in the middle of the cake. Cool in the pan on a rack for 15 minutes. Invert the cake onto a serving plate or cake tray and cool completely. Combine the confectioners' sugar with the 2 tablespoons of rum and 2 tablespoons of melted butter. Add milk or eggnog to thin, if necessary. Add more confectioners' sugar if too thin. Drizzle the glaze over the cooled cake.